The Montgomery County Planning Board invites Damascus-area residents, businesses and others to offer their ideas and comments at a public meeting on Thursday, April 20, at approximately 7:30 p.m. in the Cedarbrook Community Church conference room on a proposal of the Montgomery County Council's Planning, Housing and Economic Development (PHED) Committee to modify the proposed Damascus Master Plan to reserve land for a potential two-lane bypass around the west side of Damascus, while evaluating whether to formally establish a bypass route. Cedarbrook Community Church is located at 23700 Stringtown Road, Clarksburg, Maryland. The proposal recommends that land be reserved for a bypass route along the west side of Damascus until it is determined whether a bypass should be formally recommended. This proposal also calls for the State Highway Administration to lead a study during the next two years with Montgomery County and other surrounding counties to identify and evaluate various transportation options to increase capacity in the MD 124/MD 27/MD 75 areas between I-70 and I-270 including, but not limited to, a bypass around Damascus. If this study results in a recommendation for locating a bypass route, a further multi-year study would determine the final route. Construction of any such bypass would not be considered for another 15-20 years after a route is selected. The proposal derives from a concern that although traffic forecasts predict that traffic congestion in Damascus will be within acceptable limits through Year 2025, continuing growth beyond the County boundary could result in difficult congestion levels in Damascus after 2025. The transportation options study would be expected to address how best to direct through traffic from Carroll, Howard, and Frederick Counties away from the Damascus Town Center and residential neighborhoods along MD 27. 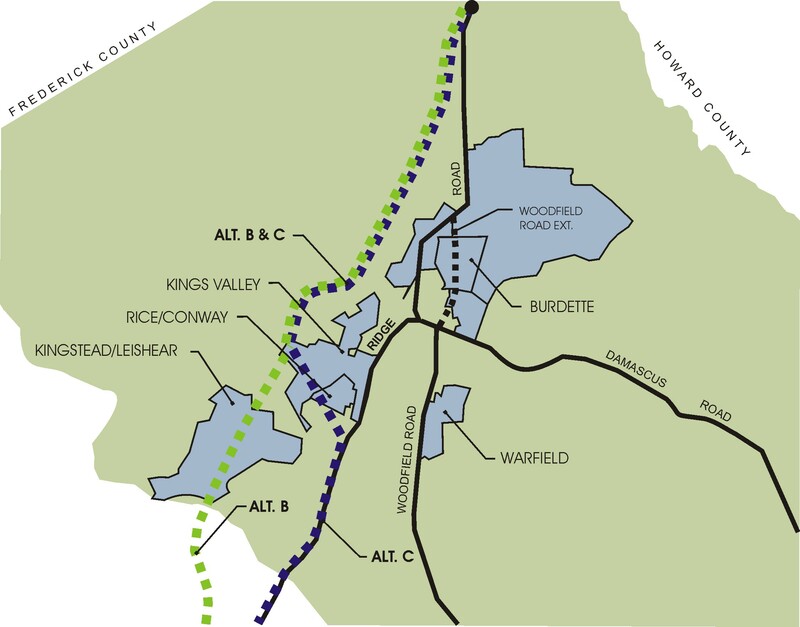 During the Montgomery County Council's work on the Damascus Master Plan, members of the Council's PHED Committee requested the Planning Board solicit public opinion about a the bypass reservation proposal since reserving a road alignment was not discussed at previous community meetings during the master planning process, although a through traffic study was recommended by the Planning Board. Many area residents attended a community meeting in Damascus with the planning staff on March 28 to learn more about the proposal, and learn how to voice their opinions to the Planning Board and County Council. The April 20 meeting will allow the community an opportunity to comment formally on the proposal, directly to the Planning Board. After reviewing the proposal and considering public input at the meeting, the Planning Board will transmit a report to the County Council's Planning, Housing and Economic Development (PHED) Committee with their recommendation and with the comments received from the public. The Council will then consider the Planning Board's recommendation and community comments received and decide on the issue of reserving land for a potential bypass route. All community residents and organizations are encouraged to attend and participate in these important meetings.